International trade is on the rise in Georgia, thanks to activity at deepwater ports in Savannah and Brunswick and Atlanta’s Hartsfield-Jackson Airport. The combined value of imports and exports exceeded $82 Billion last year. At the Port of Savannah, mammoth freighters are docked at berths, their holds and decks stacked with containers bearing labels from Beijing, Hong Kong, London, Hamburg, Mexico City and other distant places. Cargo soon will be moved out by truck and rail and the emptied vessels loaded with new goods before they sail off to be replaced by other ships, as the cycle continues – and volume increases. Some 250 miles to the north, Hartsfield-Jackson Atlanta International Airport, best known for the millions of passengers it serves each year, has its own operation devoted to the international movement of goods. Air cargo planes carry familiar airline names, but they are packed with produce, industrial chemicals, auto parts, machinery components, live animals and other items that need to move fast. “We’re really a global gateway,” says Hartsfield-Jackson Aviation Development Manager Warren Jones. Each week nearly 70 cargo flights go back and forth between Asia and Europe. In 1996 there were fewer than 30. In reality, the seaports at Savannah and Brunswick and the airport in Atlanta are portals of international trade not just for Georgia, but for the Eastern United States as well, thanks to Georgia’s strong logistics network, which moves goods swiftly and efficiently to and from the ports. Georgia has become a big player in world trade, to the tune of $82.5 billion a year, according to the Georgia Department of Economic Development. That figure represents the value of imports and exports; but international trade also supports some 115,000 Georgia jobs. Indeed, the success of many local industries is dependent on exports or sales to other nations. Georgia’s trading partners include familiar ones such as Canada, Mexico and Europe; but Asia, and particularly China – which is now number three in level of trade – have become increasingly important. “In addition, exports create twice as many jobs as domestic trade, and export [related] jobs pay an average of 15 percent higher wages,” says Heidi Green, deputy commissioner of the department’s Global Commerce Division. The state’s poultry business has created a strong export market, along with equipment manufacturers and the industries that produce clay and forest products, Marchand says. While most people think of international trade in terms of goods coming in and U.S. dollars going out, in reality the ports have maintained a very balanced approach to imports and exports. Since 2003, overall trade with China, including Hong Kong, has grown 64 percent. Over that period imports have grown 65 percent, but exports have kept pace – growing by 63 percent. In addition, exports from Savannah to Northeast Asia now outnumber imports by more than 2 to 1, according to GPA figures. Exports to Europe, India and the East Coast of South America have seen similar increases. That balance of trade is especially attractive for shippers who must pay for processing each container through the port – whether it’s filled or not. If they unload a full container and pick up another filled one for the trip out it cuts their expenses and boosts profits. Savannah is now the second busiest container port on the East Coast and the fourth busiest in the nation. More than 19.49 million tons passed through Savannah alone during the 2007 fiscal year – up 10.6 percent over the previous year. The number of ships docking at the port increased by 100 to 2,680. Vessels this year loaded and unloaded a record amount of cargo, which is measured in Twenty-Foot Equivalent Units or TEUs. Some 2.34 million TEUs were recorded this year. In fact, the ports – at Savannah and Brunswick – are now doing as much business in a single month as they did in an entire quarter 10 years ago. Port officials expect the TEU number to reach 6.5 million in 2017 – just 10 years away. Savannah and other East Coast ports have also benefited from West Coast ports’ labor troubles and lack of capacity. In recent years Asian shippers have taken the longer route through the Panama Canal to avoid long and expensive waits in the waters off California. “We see much more cargo coming on all water routes through the Panama Canal and the Suez [Canal] to the East Coast because the West Coast land side congestion is getting worse, and there is just much more uncertainty about getting cargo into the heartland of the country,” says Georgia Ports Authority Board Chair Stephen S. Green. Once ships dock in Savannah they can access the extensive network of highways and rail lines that snake up and down the eastern seaboard and into the Midwest, reaching much of the U.S. population. Location and logistical infrastructure are prime advantages at Hartsfield-Jackson as well. Just as seaborne trade has increased, so has air cargo. In 2005 more than 327,000 tons of goods with an estimated value of $28 billion were shipped out of Hartsfield-Jackson. About 79 percent – $22.1 billion worth of manufactured and agricultural goods – originated in Georgia and five surrounding Southeastern states. Production of goods shipped through the airport required some 74,000 direct jobs that paid a total of $4 billion in personal income. Those efforts netted Cathay Pacific Airways, one of the world’s largest airlines, which began service to Atlanta with four cargo flights per week in November 2005 and now offers daily service to points in Asia. The easy access provided by sea and air has made Georgia an attractive destination for companies. That’s particularly true when they need to transport highly specialized equipment to a new site. It also has a spillover effect into surrounding states. Not every new facility gets located in Georgia. Take, for example, the Nissan assembly plant in Smyrna, Tenn., or the BMW facility in Spartanburg, SC. Both make use of Atlanta’s airport for shipping. Of course, the growth in trade didn’t happen by accident: The Ports Authority has undertaken an extensive effort to market its facilities around the world by approaching both shippers and cargo owners about adding Savannah or Brunswick to their route, says John Wheeler, GPA’s director of trade development. Insiders call this the push/pull effect. While the port is pushing the carriers to bring their business to Savannah, the cargo owners are pulling the ships in with their established logistics centers. One obvious result of this process is increased business within the state that would have gone elsewhere absent the port’s attraction. To keep up with this expanded business, the Ports Authority anticipates spending more than $1.4 billion on capital improvements by 2015, including a projected $411-million harbor deepening effort, which Doug Marchand sees as critical. Earlier this year, he says, the Panama Canal Authority began a $5.2-billion expansion that will allow it to accommodate a new class of ship (known as post-Panamax) capable of carrying more than twice the number of containers as the vessels that currently sail the seas. Bigger ships mean lower costs for shippers and thus encourage more trade, ports officials say; they also represent a challenge to the ports to keep up. Bigger ships require deeper harbors. 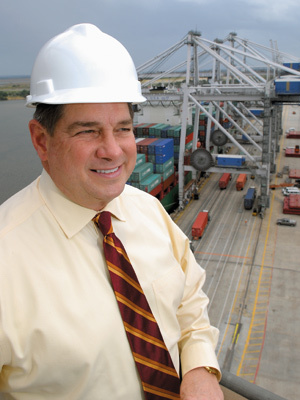 With the Panama Canal project slated for completion in 2014, Marchand says deepening the Savannah harbor from 42 to 48 feet is his top priority. Marchand’s confidence has to be tempered somewhat by funding issues. The Savannah Harbor Expansion Project (SHEP) would be one of the largest civil works projects the area has ever seen; officials and supporters still have to convince the federal government that the project is worth the cost. “It is clearly the single most important issue that confronts us, because without the deepening we won’t be able to accommodate the post-Panamax size ships; and that would put us at a distinct competitive disadvantage,” Green says. Plans call for work to begin by 2009 and be finished two years ahead of the Panama Canal work. Hartsfield-Jackson has focused extensive efforts on making its runways an easy destination for shippers. Most flights arrive after midnight following a long haul from places such as Beijing, Hong Kong or Singapore. They taxi to one of three main cargo complexes that cover some 2 million square feet of cargo handling space. In these secluded locations, workers quickly unload goods into a cavernous warehouse. The airport has built its extensive air cargo service via low cost and efficient service. A 747 freighter can land at Hartsfield-Jackson for just 86 cents per thousand pounds of weight – or about $900. Contrast that with Dallas-Fort Worth’s $2.83 per thousand pound charge or the $5.15 charged by New York’s JFK Airport. “The volume of all those planes keeps our cost down low,” says Warren Jones. The airport also makes it easy for air freighters to get in and out. There are no requirements that flights fill a particular time slot; that and the Atlanta airport is open 24/7, while many others close down at night. Those factors make a strong case among shippers for Atlanta. In fact, much like the seaports, Hartsfield-Jackson has, to some extent, profited by taking business from other locations. To keep the business going, marketing officials are constantly visiting potential shippers to build relationships. They want to ensure these companies add Atlanta to their routes when more planes are put into service.